Amidst the economic recession and various recall nightmares, the auto industry has taken some kicks and punches in the past couple of years. In 2009, automakers decreased advertising spending for TV, magazines, and radio by an average of 13 percent. To compensate, many have beefed up their social media presence. Below is a sampling of what some car companies have been doing in recent months — both successes and failures. Kia has experienced market growth in the U.S. 15 years in a row, thanks in no small part to its growing social media presence. That presence will keep growing, too. “Digital and mobile media will be a big focus this year,” said vice president of marketing Michael Sprague. Central to the effort is […] the single-channel, social media platform — via thisMoment — [that] ties together sites like Facebook, MySpace, and YouTube, the brand’s own site and the iPhone in real-time. User-generated submissions can be uploaded directly to the channel or pulled from a user’s existing social media library, and can be moderated by the brand. It’s not what you’d call social media in the strictest sense of the term, but Subaru launched a website earlier this month, BadgeOfOwnership.com, where owners can buy badges to affix to the back of their vehicles. 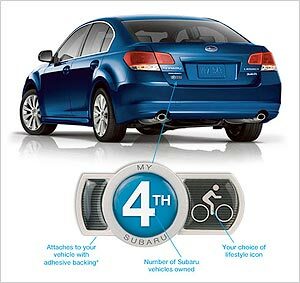 The badges display a number that indicates how many Subaru vehicles the driver has owned, and can be personalized with other images representing hobbies and other passions or achievements. It’s part of the company’s “Love” loyalty marketing campaign, which began last year. One of the big winners in social media amongst the auto industry is Ford. A year ago, Ford was being <a title=””Automakers thrive on social networking’s ‘Internet chatter'”” href=”http://www.lvrj.com/drive/44123057.html” target=”_blank”>praised for its social media efforts, and the accolades haven’t slowed down. Although Ford did not place within BrandZ’s 5th annual Top 100 brands list, the company still climbed 19 percent from last year’s figures. Ford’s resale value is also up, something that the latest Automotive Lease Guide study of automotive consumer attitude attributes to a shift in public opinion. That shift owes a great deal to Ford’s social media efforts. At Advertising Age’s Digital Conference in April, Jim Farley, Group Vice President of Marketing and Communications for Ford, told attendees that the economic recession pushed the company to try more digital marketing. Farley said, “Everything has to work in this economy. If the economy hadn’t dropped the way it did, we would have been on auto pilot and not experimented the way we did. Our production quality online is better than our broadcast.” Now, one out of every four dollars spent by the company is in the digital realm. “Among the many things that Ford took away from the [economic] ordeal — including better sales and a massively improved brand image — was a new understanding of how to market itself, using digital media and content created by the company’s own customers,” writes Richard Read, a reporter for The Car Connection. Ford had been losing market share in the U.S. for 14 years straight, but gained some back in the past 24 months, since they started to offer companies like the All Tune & Lube, an auto repair shop, to their customers. Some of Ford’s social media experiments include its launch of the 2011 Explorer on Facebook rather than the traditional reveal at an auto show, as covered here on the SixEstate blog a couple of weeks ago. There was also the launch of the 2011 Fiesta with the “Fiesta Movement” marketing campaign which had resulted in more than six million YouTube views, 740,000 Flickr views, and 3.7 million Twitter impressions. Even more impressive was the 60 percent vehicle recognition score in Ford’s survey findings, “a number that would be good for a vehicle that has already been on the market a few years,” as noted on the Auto Blog by reporter Chris Shunk. These teams are going to be made up of part-thinkers, part-social butterflies. New agents will create content that taps into the unique cultures in each city, all the while sharing their experiences with Fiesta. People are talking about our brand right now. [This] lets us be involved in that discussion. “I can tell a story in 15 seconds now on TV, but I want customers to tell our story… That’s what digital has shown us: how to earn credibility among consumers,” said Farley. Social networking sites like YouTube and Facebook are free for companies to use and allow customers to share their stories and other feedback more easily. We’d ask that whether you’re talking to a dealer, reviewing dealer advertising, or speaking with friends and family, that you communicate our brand as Chevrolet moving forward. When you look at the most recognized brands throughout the world, such as Coke or Apple for instance, one of the things they all focus on is the consistency of their branding. Why is this consistency so important? The more consistent a brand becomes, the more prominent and recognizable it is with the consumer. It’s unclear why they decided to make that change now, after all of these years, especially when the nickname is so ingrained in pop culture. Matt Creamer, executive editor of Breaking Media, said of GM’s choice, “It is worth looking at what this says about the chasm between the use of social media as a marketing practice and the creation of a culture that is built on truly listening to consumers.” Creamer is quite right. Don’t go through the motions of pretending to “be where our customers want us to be” if you’re not even willing to actually listen to and understand your customers. Screen capture from Subaru’s Badge of Ownership website used under Fair Use: Reporting. 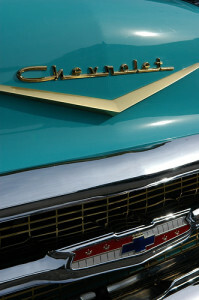 Chevrolet image by linecon0, used under its Creative Commons license.